There’s no magic formula ‘to make you better’. Each therapeutic relationship is unique and develops according to my client's specific needs. 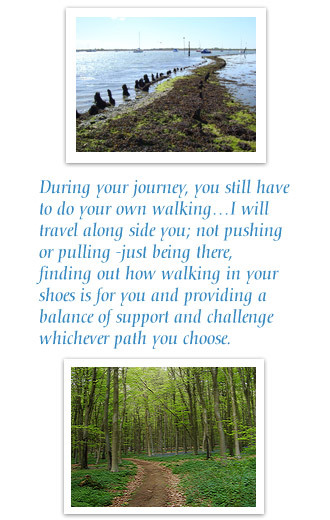 My role - From a starting point of believing we are all ‘OK’ and capable of thinking, deciding and changing, I see my role is to support and empower you… through our work, our relationship and your increasing self-awareness to help you move positively forward with your life. My aim - We sometimes have established patterns of behaving, thinking and feeling about ourselves, other people and the world that may have served us well in the past but are not working for us now. My aim is to help you establish where or how you would like to be and to discover, understand and change whatever you decide in order to make that happen. How - This is possible through open communication, mutual agreement on what you want to achieve and how, combined with regular reflection on that process. The psychotherapeutic tools I use depend on what you want from therapy. Tailoring – Some clients are empowered by having a secure relationship in which to address what they are feeling. Others can need help to learn how to recognise, express and explore their emotions. Some people benefit most by gaining understanding of their experiences through theoretical explanation. Together we can figure out which combination is most effective for you and tailor our sessions accordingly. Group Therapy – After initial individual therapy, I recommend some clients join my therapy group. This is entirely optional and enables these individuals to use the group experience to continue to explore their relational patterns and address the issues that brought them to therapy.